Stay tunes for our upcoming class schedule and updated registration forms. Sweetwater 2019 Sea Kayak Symposium Registration Form. Registered Maine Sea Kayak Guide Senior Sea Kayak Instructor- St Michael’s College Wilderness Program Adjunct Instructor, Expeditionary Studies Program,SUNY Plattsburgh With the exception of a few misguided years a while ago, John has lived on the ocean his entire life. He has been in and around most every type of boat, tending towards the wind and human powered types. Almost 20 years ago, the sea kayak became his vessel of choice, and he has enjoyed adapting his “Big Boat” skills to kayaks. John’s love of the traditions of the sea is infectious as he passes his seamanship and navigation skills on to his students. As a Coach, his understanding of the human body and biomechanics, gives him unique insights into what will make his students more efficient, safer from injuries and better able to enjoy these centuries old craft in more exposed environments. John has led trips throughout Maine, the Canadian Maritimes, and the British Isles. He regularly instructs at Kayak Symposiums throughout the US. 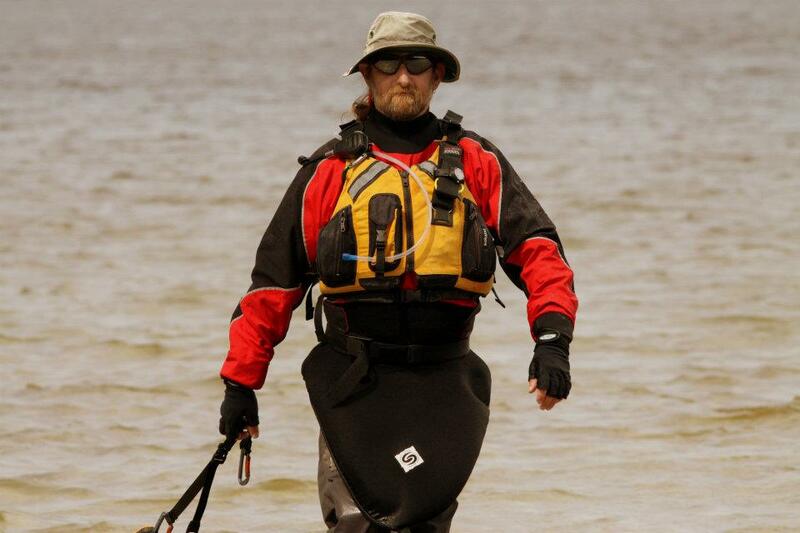 John is a Team paddler for both P&H Kayaks and Werner Paddle. TSRA Certified Solo Open Boat. ACA Level 2 Canoe Coach. Russell’s excellent product knowledge enables our customers to be outfitted to best suit their paddling needs. In addition to sea kayaking, his outdoor background includes mountain biking and climbing. These sports have taken him all over the world; Scotland, France, Switzerland, Canada, Andorra, Spain, Morocco, Hawaii, and North America. Among Russell’s many talents, he is also a professional musician. He plays guitar in the band, “Sizemore”. There music is available on iTunes and tangoradio.com and at the shop. He has appeared on Saturday Night Live. In 2005, Russell organized the Labrador 2005 Expedition and paddled down the northeast coast of Labrador (Some call it one of the most challenging coastlines in the world.) 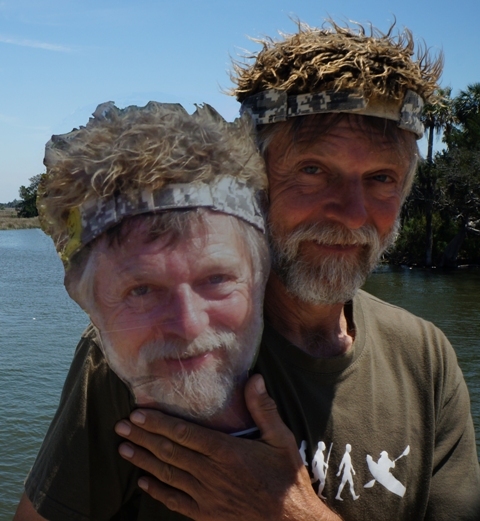 In 2007 he paddled in Florida (leading trips in the everglades), the Outer Banks of North Carolina, Mexico, San Diego, Deception Pass, Washington, Alaska, Scotland, Outer Hebrides, and Georgia. He and his “Team Sweetwater” won the IR Vacation to Hell grant, and in the summer of 2008 paddled in the High Arctic of Canada’s Baffin Island. A DVD and presentation has come out on that expedition. He has written articles for Canoe Focus Magazine as well as developed paddling and adventure DVD’s. In the summer of 2013 he paddled across the Baltic Sea, from Stockholm, Sweden to Helsinki, Finland. Nigel Foster is a long-time close friend of Sweetwater Kayaks. He is known for his well-thought-out easy-steps teaching style, his broad experience in kayaking, and his playful sense of humor.His international kayaking reputation is built on his instruction and expeditions, his designs, (nine of his sea kayak designs have been commercially produced, not to mention his paddles, pfd’s and accessories), his instructional videos and DVDs and his numerous books and articles. In recent years he has been working closely with Point65 of Sweden.He is the first sea kayaker to be inducted into the International Kayaking Hall of Fame, but you can find him on the web at www.nigelkayaks.com, or anywhere with good espresso and guitars. Beware of imitations! Phil, known to friends as “Foxy” is from a town in the heart of England called Dudley, although fairly close to Birmingham – he is NOT a Brummy! For those people who don’t know Phil (there can’t be many!) he was the West Midlands Paddlesport Development Officer for nine years and contributed two chapters to the BC Coaching Handbook. Phil is massively involved with the BC: as a national trainer he is one of the key people rolling out the new Coaching Programmes and Performance Awards in the UK , Europe, Mexico and the United States . Phil does a lot of work approving centres for the BC and is the technical adviser of choice for many centres and organisations. Phil ran the first ‘new’ Level 1 course in the US back in 2008 at the Sweetwater Symposium and is looking forward to visiting Florida again to deliver more courses with his infectious enthusiasm. He has a BSc Hons degree in Sports Science and loves paddling and coaching. 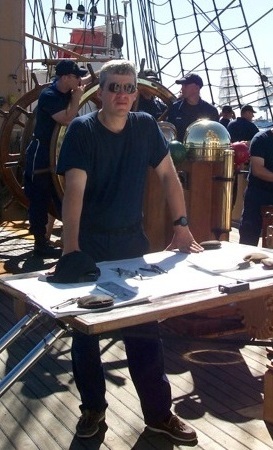 For the past ten years, Steven Henkind has served as a Navigator (Quartermaster of the Watch) and Navigation Instructor on board the Coast Guard’s training ship EAGLE. In this capacity, he stands navigational watches and trains Coast Guard Cadets and Officer Candidates in piloting, celestial navigation, and electronic navigation. He is also qualified as a crew member on the Coast Guard UTB41 and RBS25 boats and has participated in numerous safety and search and rescue missions. In addition to his time on board EAGLE, he is also an experienced offshore sailor with over 20,000 ocean miles (including two transatlantics, and a second place finish in the Marion to Bermuda Race) under his keel. Lamar founded Barrier Island Kayaks in 1996. He has now accumulated over 30 years of kayaking experience with over 22,000 miles behind the paddle. He has worked as head guide for Wildwater Ltd. on the Chattooga River, managed High Country Outfitters on the Ocoee River, worked as a trip leader and instructor for Nantahala Outdoor Center and Senior Field Staff rock climbing and paddling instructor for Camp Woodson Therapeutic Wilderness Camp. Lamar’s guiding experience on Section IV of the Chattooga River was written up in National Geographic in April 1983. Lamar was awarded the BCU 5 Star in 2004 from Nigel Dennis at an assessment in Anglesey, Wales, UK. At that time, this award was held by less than 15 paddlers in the United States and qualifies Lamar as one of the highest ranking BC sea coaches in the US. His passion for open sea paddling has taken him to Wales four times and Lamar now leads advanced sea kayak trips to the UK. Carl’s knowledge of the ocean started as a young boy, fishing and sailing on the waters of coastal New England. At Prescott College he discovered the world of paddle sports, first with white water in the desert rivers of the Southwest, then the bliss of sea kayaking in the Sea of Cortez. He and his wife Sam co-founded Osprey Sea Kayak Adventures as a paddle sports school in 2001. Osprey’s initial focus was sea kayak education, but has since expanded to include surf kayaking and stand-up paddle-boarding (SUP).He has a patient and relaxed style of coaching and is always finding new and fun ways to transfer his knowledge of the sea and small paddle craft. Carl has lead trips all over the globe, from the Sea of Cortez, The Virgin Islands and the Exuma Islands to The Greek Islands, Portugal and Greece. He can most often be found playing in the rocks and surf off the coast of his home in Rhode Island. Carl is proud to be a team paddler for P&H Kayaks and Werner Paddles. Prior to plunging into the sport of kayaking in 2005, he spent years racing sailboats and fishing the lakes of Northern Ohio. He took his love of water with him as he headed off to college in Southeast Ohio where he majored in computer science and minored in mathematics. While at college he enjoyed canoeing and fishing the numerous fresh water lakes and rivers. He has continued his formal education by completing an MBA from the University of Phoenix in Tampa. So when doesn’t have his nose in a textbook or is not on the water paddling, the most likely place to find Chad is coaching kayaking, canoeing, or standup paddleboard courses offered through the shop or handling Sweetwater’s rental fleet at Weedon Island Preserve. Chad is currently a British Canoe (BC) UKCC Level 2 coach and is seeking to obtain his BC UKCC level 3 coaching certification so he can help advance others in a sport that he loves. In addition to his participation in kayaking and other water sports he has a full time career in the information technology (IT) field, including owning his own business (KC Computing, LLC). He loves all types of music, bowling, cooking, rollerblading, weight lifting, Texas hold’em, and is an avid golf duffer. FORE!!!! Steve has been working as an outdoor educator since 1987 and has been lucky enough to learn from and work with some of the best practitioners in the field, to teach a wide variety of clients in multiple land and water based disciplines all in some of the most spectacular locations Europe and North America have to offer. Steve’s specialization is Paddlesport but his professional resume includes skiing, backpacking, climbing, navigation, outdoor living skills, personnel development, youth work, problem solving etc. etc. Steve started kayaking on remote sea lochs in North West Scotland. Since then he has paddled, guided, coached and been coached extensively in the United Kingdom, and throughout Europe and North America. Steve holds qualifications in many adventure sports, including sea kayaking certifications at the highest level from the British Canoe (BC Level 5 Coach Sea, 5 Star Assessor Sea, BC Level 3 Coach White Water, UKCC Coach Level 1 and Level 2 Director) and American Canoe Association (L5 Advanced Open Water Instructor and Level 4 White Water Instructor). Never one to rest on his laurels Steve is currently working towards his UKCC Level 4 Coach/M.S. in Performance coaching through Stirling University in Scotland. After nearly 20 fun filled years of being constantly on the move Steve took a “Proper Job” with the Expeditionary Studies B.S. and M.S. at the State University of New York, Plattsburgh campus. He is currently the head of Paddle Sports and Outdoor Living Skills for the Expeditionary Studies program and in his spare time continue to teach classes for other paddling schools, present at kayak symposiums and organize/work on BCU and ACA certification courses. One of Steve’s biggest pleasures in life is helping people improve their understanding of technique and environment to enable them to have more fun and be safer in the outdoors. John is an avid outdoorsman, wildlife biologist and paddler. His interest in canoeing began over 40 years ago, and includes leading wilderness river trips in the 1970s. In the early 1980’s he built a 16 foot redwood strip tandem canoe. In late 2003 he discovered sea kayaking and was instantly hooked. John has been a member of the American Canoe Association (ACA) and British Canoe (BC) since 2006. John is a founding member of Paddlesports North America (PNA), a nonprofit formed in 2013 to deliver British Canoeing programs in North America, and currently serves on the Board of Directors as Treasurer.